There are several schools of thought when it comes to power conditioning. I probably have most of them represented in some form in my home. Hardly any piece of electronics that I own, save the coffee maker, is plugged directly into the wall without some sort of device acting as a surge protector or power conditioner. I have many brands and types, representing the gamut of price points. Some act as simple protection against electrical surges and spikes, and others as actual audio enhancements. Yes, they do absolutely work as audio enhancements. This is not simply about cleaning up (filtering) line hum from other electronics that are running in your house but cleansing the AC line of the nastiness that comes from the power company itself. The better your amplifier, your cables, and especially your speakers, the more apparent all this noise will be. Gudebrod only makes a couple of products, but what they make are truly drool-worthy. I’ve written about both of them before. 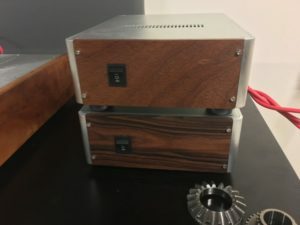 Their tube preamp is simply to die for, but at its $7,000 price tag, is out of the scope of what I try to do here in my blog. However, that should not stop you from doing whatever you can to audition it some time. 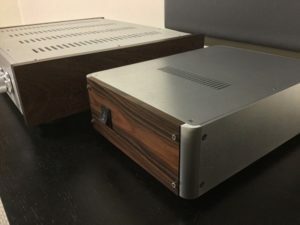 Their other product is the ridiculously affordable (at just over $500) and amazingly effective AC120/3 power conditioner. This unit is priced lower than many of its more well-known competitors but outperforms anything I’ve heard at far higher prices. Gudebrod actually calls this an AC purifier, rather than a power conditioner. It seems like a bold term for a box that has no readout, no lights, and no LED display telling me anything about what my voltage is doing. Instead, the magic occurs behind a beautiful solid panel of rosewood- all beauty with no fanfare. The change was immediate and very noticeable. This was not “sighted listening” or any sort of biased approach. There were striking differences. The high hat had considerably more detail and sharpness, the bass was tighter, the soundstage was deeper, and instruments were more forward in places. Not my imagination. I put in Jean-Luc Ponty’s “Cosmic Messenger.” I heard a wider field in the recording than I had just heard an hour before, listening to it with the APC unit. The big bottom line here, beyond getting technical, is that the music instantly became more enjoyable. Isn’t that what we’re really seeking here? 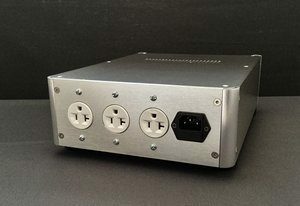 On the front panel of the Gudebrod, there is a polarity switch, which flips the center outlet. When I heard this switch demo’d originally (see “What Is a Guy Like Me Doing Here” 3/30/2018), it was on a tube amplifier. The difference was pretty bold. It added quite a bit of low end to the sound. I was warned that, because I was using a solid-state amp, I might not hear an appreciable difference. That was correct. When I tried the PS Audio amplifier in this mode, I heard virtually no change. 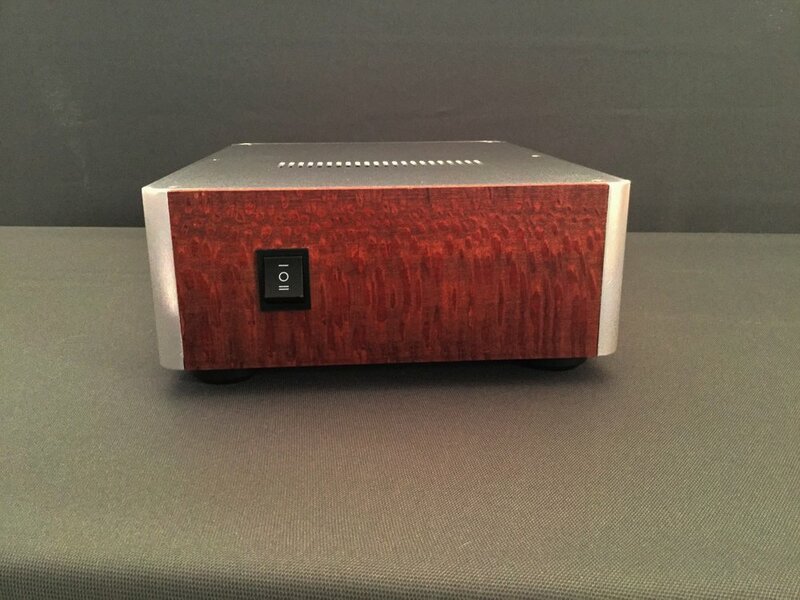 Invariably, the Gudebrod AC120/3 AC Purifier is most at home in a high-end system. However, I wouldn’t connect any system, even an entry-level one without some sort of power conditioning. So, if you’re going to do it, why not do it right? Yes, the better your equipment, the more you will reap the rewards of the Gudebrod purifier. But, even with a shoestring system, this one seems like a no-brainer. If you’re running tubes, the Gudebrod becomes an even more obvious choice. So, how do they do it? What’s in this beautiful box? According to Eric Krupp of Gudebrod, it’s as much about what’s not in the box as what’s in it. They use no transformers in their circuitry. All three outlets are filtered individually, so everything isn’t tied together as one string of outlets. They claim this isolation gives your music blacker backgrounds and more life. I can back up this claim, as I have heard it for myself in multiple systems with the AC120/3. To reference their website: “The AC120/3 is a component that removes unwanted EMI/RFI frequencies in the Megahertz to Gigahertz range (RFI attenuation from 100khz upwards). It achieves this by stripping away the unwanted noise that piggybacks the ac sine wave in the 50-60 hertz range without disturbing it.” In addition, 12ga solid core wiring is used throughout the entire unit. The world of AC treatment is a vast one. You can spend a king’s ransom battling the gremlins in your electricity. Or, you can invest in a couple of these beautiful boxes from Gudebrod. 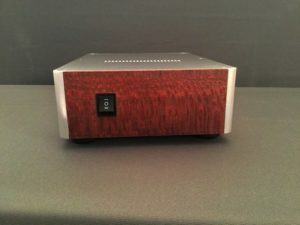 The Gudebrod AC120/3 AC Purifier appears to be one of the most sensible upgrades to an audiophile’s system at a price that is incredibly reasonable. I highly recommend the Gudebrod AC120/3 AC Purifier!